Trailhead: After the Flume Visitor Center parking lot, exit 34A off 93 (note that there is construction right now, so take exit 33), there is a big wooden sign that says "Trailhead". The official name is the Whitehouse Trailhead, although it's not well marked as such. Google maps here. We went up Mount Liberty and Mount Flume on a beautiful Wednesday morning, after it had rained the day before. Because I was going up with 2 black labs, I decided to avoid Flume Slide Trail completely. Instead, I double backed on Liberty Spring Trail for a roundtrip mileage of 10.65mi and 3,921' elevation gain (according to MapMyHike, compared to the book stats above). Both mountains are located in the very popular Franconia Ridge, only a 2 hour drive from Boston. From the Whitehouse Trailhead, you will hike 0.9 miles in a flat wooded area until you reach a paved road used as a bike path. Turn left to go on the bike path. There are options to cool down in the Pemi River here. The signage is pretty good from the parking lot, following blue blazes. After 0.6 miles on the paved road, you will start your ascent up the Liberty Spring Trail. Note that you can either go right towards the Flume Slide Trail, and loop back around on the Liberty Spring Trail, or go left and return back via Liberty Spring Trail which is what I did. At the summit I talked to 3-4 hikers who did Flume Slide and their words were "never again." There is a ton of slime on the rocks that makes it difficult to ascend, especially with dogs. It's 2.6 miles until Mount Liberty. The first mile or so on the Liberty Spring Trail is gradual with a few manageable water crossings. It's also a good time for your pups to drink water so you don't have to carry any water up for them! The trail was a little muddy but nothing that would make it too difficult. I did see a few young guys attempting to summit in skinny jeans and Sperry boat shoes. I don't think they got very far. The last 1.3 mile push up to Franconia Ridge can be a bit strenuous. When you pass the Liberty Spring Tentsite, where there is currently a Bear Alert, you're almost there! There is a water fill-up spout at the site if you want to pack lighter with water weight. At the top where you hit Franconia Ridge, there is an option to go left towards Mount Lafayette or right to our destination, Mount Liberty. 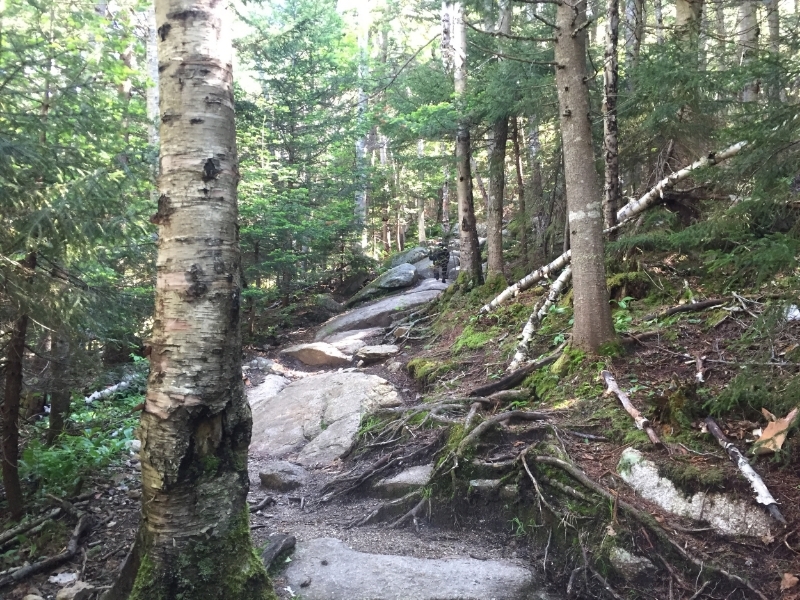 The last 0.3 mile push to the summit of Mount Liberty is a nice relaxed walk. Most people stop at Mount Liberty to eat their lunch, but I hit the summit at 10:38AM and decided it was too early to stop. So, I pushed onto Mount Flume which is 1.2 miles away. There is one descent down a sloped slab of rock that may be tough for dogs. I had to encourage one of my pups to come down. The trail to Mount Flume is generally relaxed as well, with a small climb towards the end. I didn't think the view at Mount Flume was as impressive as Liberty, but it was quieter and less windy so I ate lunch with the pups here. There were a few bugs on Flume, but other than that it was mostly a bug-free day. After lunch, I turned around and made my way back to Liberty. Ascending up to Mount Liberty on that sloped slab, I had a LOT of difficulty with one of the pups. I had two labs with me: a 1.5yo 50 lbs mix, and a 2yo 90 lbs full lab. Unfortunately the 90 lbs lab was distressed. I waited about 30 minutes for another hiker to pass me, and he helped pushed the 90 lbs fella up the slab while I pulled his front legs up. Thank you!! All in all it was a great day of hiking. Dog owners: i would recommend that your dog have ample hiking experience, or you have more than one person with you to push your dog up between Flume and Liberty.